Wash and spin dry baby spinach. Quarter figs and cut red onion into fine rings. Roughly chop walnuts. Peel mixed beets and roughly grate the red beets, cut the yellow ones into wedges, and thinly slice the Chioggia. For the dressing, add apple cider vinegar, honey, olive oil, walnut oil, mustard, salt, and pepper to a bowl. Stir well to combine. In three separate bowls, combine grated red beet, yellow beet wedges, and Chioggia beet slices with half of the honey mustard dressing. 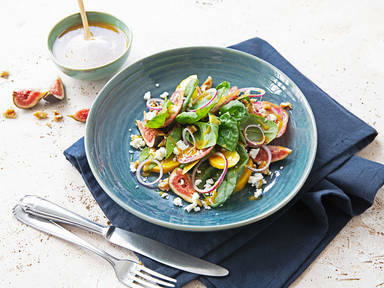 Serve mixed beets with figs, spinach, walnuts, and red onion rings. Crumble feta cheese over the salad and drizzle with the remaining honey-mustard dressing. Enjoy!